7. What Do You Think About Me? 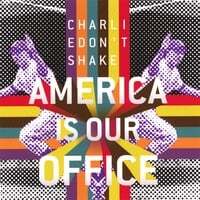 America Is Our Office is a seven-song EP exploring the haunting question of why the Detroit Pistons lost game six of the Eastern Conference Finals while Charlie Don't Shake was onstage playing at Mac's Bar, and other common American themes. This record was mixed to preserve dYnAmIcS, so you can PLAY IT LOUD!!!! Charlie Don't Shake fuses a style of 1960s rock 'n' roll and acid-folk, creating a [raw sounding EP]. Each of the seven tracks instantly recall nights fought against the desperation of insomnia, yet the music retains a formidable sense of organicism.Each song demonstrates different abilities Charlie posseses - "Shiloh" opens up the album, throwing everything in the wind with sweeping rockabilly passion. Their sound is energetic and defined, building up from a classic rock base.Even as they play through several folk-rock-acid tunes, the band has the ability to reinvent itself for the final track, "What Do You Think About Me?" The guitars slow down into a semidroning, atmospheric hum and the vocals are run through a Radiohead-esque phaser.Charlie Don't Shake has an excellent first-effort on their hands - the sound blends multiple influences from across time and across genres - 1960s rock, folk, country, acid and 1990s alternative. They rattled the cages of mainstream music and ended up with some solid, experimental tunes. Even on the upbeat tunes, Schmidt squeezes out all of the irony he can wring and serves it to his listeners as a bittersweet juice. Guitarist Jeremy Whitwam says Schmidt’s ability to write like a Midwestern Woody Allen makes the band what it is.